Romain Alessandrini’s goal was the game winner for the Galaxy. (Photo by Duane Barker). 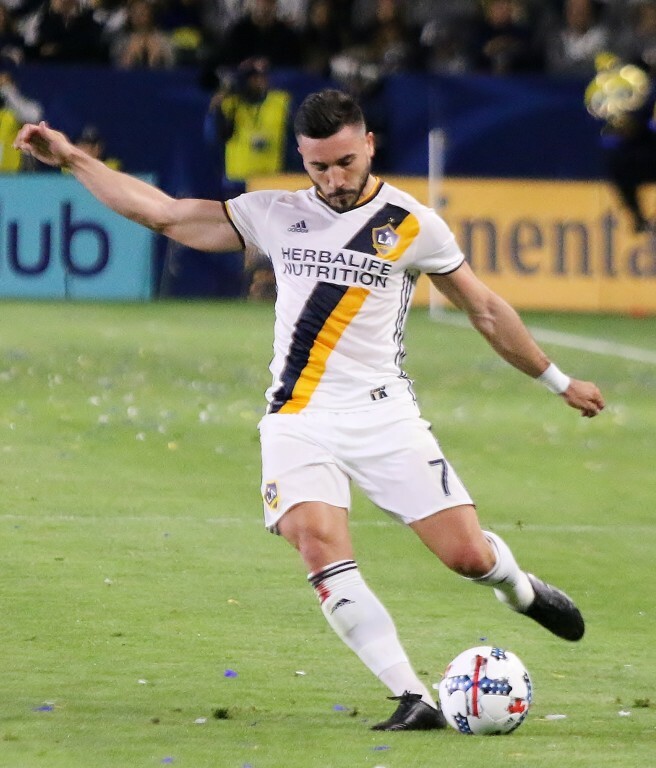 (Carson) – Romain Alessandrini’s goal in the 82nd minute lifted the Galaxy to a 1-0 win over San Jose Saturday night before 23,118 at StubHub Center. The Galaxy knew coming into the Cali Clasico that goals were going to be hard to come by, especially with Zlatan Ibrahimovic serving a one game suspension for a red card received in the previous game. It proved to be true through out the contest. Chris Pontius had a chance at the seven minute mark when he took a nice dish from Alessandrini right in front but his header sailed left. Five minutes later, Alessandrini got off a shot just outside the box but it rolled wide right. In the 35th minute it appeared Alessandrini would get the first goal but his blast was blocked by none other than teammate Sebastian Lletget who was unable to get out of the way. In the 4oth minute Alessandrini’s free kick was knocked away. Neither team was able to generate much offense in the first half. The Galaxy had just two shots overall compared to three for the Earthquakes. Neither team had a shot on target. Emmanuel Boateng replaced Pontius to start the second half and LA started to get some momentum. Boateng’s pass to Lletget in the 56th minute created an opportunity but was denied by San Jose. In the 62nd minute of play the Earthquakes were threatening in front but nothing materialized. Ashley Cole replaced Emrah Klimenta in the 66th minute. Giovani dos Santos entered the match for Lletget in the 75th minute to a loud ovation from the Galaxy faithful. The Galaxy continued to attack before finally breaking through in the 82nd minute when Alessandrini turned and then let one fly from distance. San Jose goal keeper Andrew Tarbell couldn’t make the play as Alessandrini shot it into the left corner for what proved to be the game winner. It was Alessandrini first goal since opening day. David Bingham came up with a big save off a shot off a rebound of a free kick by Danny Hoesen in the 89th minute. The ball ricocheted off the top bar and dropped down just in front of the net but not in. Two minutes of additional time were added but LA held on for its second straight victory. The Galaxy improved to 5-6-1 with the win while San Jose dropped to 2-7-3. 1 Comment to "Alessandrini Lifts Galaxy in Clasico"
I attended the Downey football spring game and I was impressed and disappointed at the same time. The players looked great but whoever was coaching the white squad was clearly out coached, they seemed to have the better players but failed to utilize them. Was still a great game.